We invite you to join us over ISEA2013 in a microcosm of the overarching reallybigroadtrip world. We’re so fluid you can even choose one of three forms to connect with us. Between 11am to 6pm on Mon 10th, Fri 14th, Sat 15th and Sun 16th June the bus will demonstrate the (inter)national adventure by hosting a mini version. Starting from Paddington we will be driving around Sydney finding locations that just feel like they would be a good place to stop. We will not be using maps, just following our noses and waiting for the place that just feels right. Once the location has been found my Nomad in Residence Kate Chapman and myself will park the bus, put out a couple of chairs and throw on the magnetic signs that indicate we are ‘open for business’. Then we will just see what happens. Some passers-by will come and ask what we are doing, so we will tell them about reallybigroadtrip and about ISEA2013 and how we want to just meet people and see what happens. Sometimes they will suggest where we go next – we have two spare passenger seats so it’s entirely possible we will take them along with us when we go. Some ISEA2013 audiences might know we’re doing this and want to come and find us in a random spare moment. We will take an instagram photograph (my account is @feesable) tagging our location so that at any time you can see where we are. If you want you can also message us directly; I’m @feesable and Kate is @wonderchook on Twitter. Be aware that we might be engaged in deep conversations with random strangers so you should let us know that you are coming so that we can hang around long enough to connect with you. And if we get ‘moved on’… well that’s all just part of the journey, right? Sat 8th, 10-11.30am – public talk on mapping culture at the Museum of Contemporary Art (MCA). Mon 10th, 11am-6pm – #rbrtISEA driving around Sydney - see @feesable / @wonderchook for locations. Tues 11th, 9am-6pm - ISEA2013 conference where you can meet homeJames and I’ll be live-tweeting #iseeISEA. Weds 12th, 9am-6pm - ISEA2013 conference where you can meet homeJames and I’ll be live-tweeting #iseeISEA. Thurs 13th, 9am-6pm - ISEA2013 conference where you can meet homeJames and I’ll be live-tweeting #iseeISEA. Fri 14th, 11am-6pm – #rbrtISEA driving around Sydney – see @feesable / @wonderchook for locations. Sat 15th, 11am-6pm – #rbrtISEA driving around Sydney - see @feesable / @wonderchook for locations. Sun 16th, 11am-6pm – #rbrtISEA driving around Sydney - see @feesable / @wonderchook for locations. 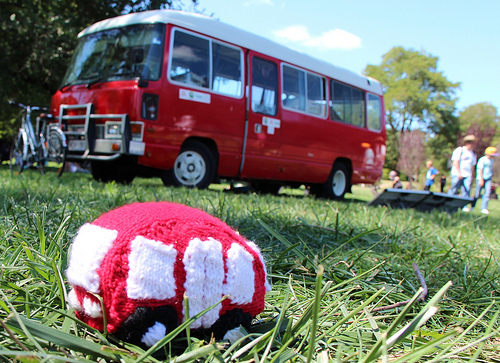 Keep an eye out for homeJames, the reallybigroadtrip bus, at ISEA2013 events and venues.